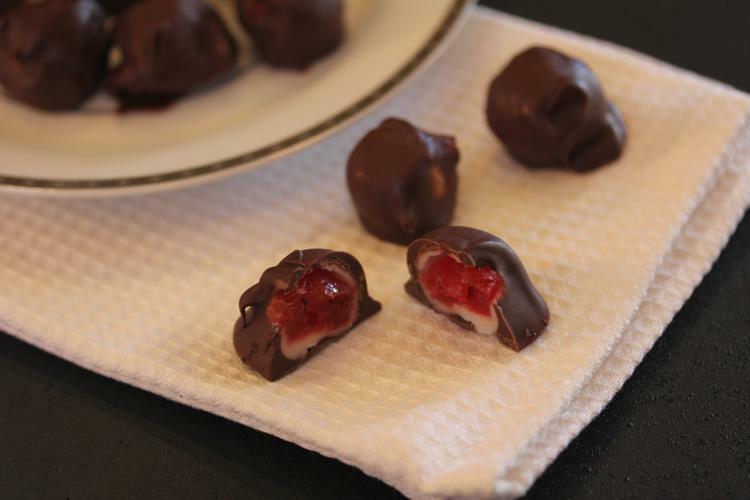 If you love cherries I think you will love these homemade chocolate covered cherries. I love making homemade candy this time of year. 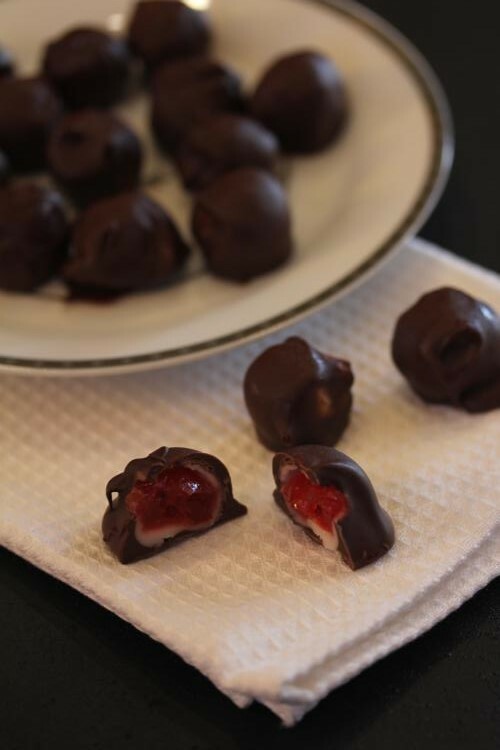 To me it is not Christmas without homemade candy. We have some favorites like homemade peppermint bars and homemade mounds bars that we make every year. But every year I also try to add some new candy in the mix. This year I decided to try chocolate covered cherries. I have seen several different versions so after asking on Facebook and asking my sisters I decided to make the kind that is wrapped in a fondant like dough and then dipped in chocolate. My sister had made a recipe from an old Taste of Home magazine and liked it, so I decided to give the recipe a try. I did adapt it slightly, but not much. Most of the recipes are pretty much the same and don’t vary a lot, so there is not much to adapt. The recipe did call for maraschino cherries with stems. I could not find any with stems so I used the ones without. They worked fine, but I will say that dipping them in chocolate would have been easier and probably prettier if they had stems on them. So if you can find the ones with stems I would use those. 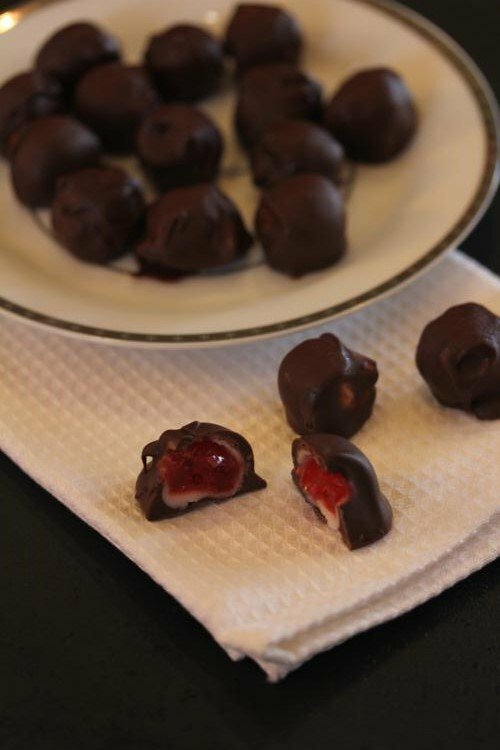 Chocolate Covered Cherries are a fun holiday treat! In a bowl combine sugar, butter, corn syrup, and salt. Mix well and knead until dough is formed and smooth. Cover and refrigerate for 1 hour. Remove dough from refrigerator and roll into 1/2 inch balls. Flatten the balls into 2 inch or so circles. Wrap each circle around a cherry. Being careful as you wrap it around the cherry. Place cherries on wax paper or silicone baking mat. Refrigerate for 1 hour. Place chocolate and shortening in a microwave proof bowl. Melt in microwave at 50% power stirring every 30 seconds until melted. You can also melt chocolate in a sauce pan on the stove top if desired. Dip each cherry in chocolate and place on waxed paper or silicone baking mat. Refrigerate until chocolate is hardened. Store covered in the refrigerator and let set 1 to 2 weeks before serving. These look YUMMY! What could substitute for the shortening(I just don’t buy it ever)? Coconut oil? It just helps thin the chocolate some and makes dipping easier, so yes butter or coconut oil should work. I have used both in other recipes and it works fine. I had some shortening so it is what I used in this. Whatever you normally do for dipping chocolate or making candy should work fine. I hope you enjoy them! Thank You! Can’t wait to make them! !